Global Industrial Eye Protection Market size was worth over USD 1.92 billion in 2016 and will surpass 270 million units by 2024. Rising workplace injuries due to lack of safety precautions has enhanced the necessity for eye protection in end-use industries. As per ISHN, the U.S. reports more than 300,000 workplace eye injuries per year. Construction, manufacturing and mining industries together account for 40% of these injuries. As per WHO, occupational accident are the second most dangerous hazards causing blindness after cataracts. Stringent regulatory framework regarding worker safety particularly in developed countries will propel the product demand. Increasing adoption of OSHA & NIOSH regulated products to minimize impact of harmful hazards are the key factors supporting the industry growth. Growing construction and manufacturing projects has influenced increase in blue collar workforce particularly in Asia Pacific and MEA. Inclination towards infrastructure development along with rising government spending on construction will propel the industry demand. Global construction industry is estimated to worth over USD 15.5 trillion by 2030. Favourable regulations, easy availability of workforce and other resources encouraged the manufacturing industry particularly in China and India. Manufacturing industry accounted for more than 40% of the China GDP in 2016. India manufacturing industry is anticipated to worth over USD 1 trillion by 2025. Shifting employer focus on occupational safety along with increasing consumer awareness about importance of protective equipment has enhanced the product scope. Industrial eye protection equipment can avoid more than 90% of the vision injuries through effective usage. Superior protection against impact, heat, chemicals, and harmful radiation are the key properties driving the industrial eye protection market. Technological advancement coupled with emergence of innovative products including laser protective goggles will propel the business growth. Increasing raw material prices including plastic and polycarbonate are the major factors affecting the price trend. Lack of mandatory regulations along with low importance for employee safety in some regions are the major restraints for the industry growth. CR-39 accounted for more than 39% of the overall industrial eye protection market share in 2016. Potential outlook in several safety equipment owing to its superior impact resistance along with low-cost, easy availability properties will fuel the industry growth. Rising demand for durable and sustainable material to manufacture advanced products will drive the industry size. Polycarbonate market was valued over USD 760 million in 2016. Increasing product usage in intensive applications including construction, automotive, consumer goods & pharmaceuticals industries will propel the demand. Better process-ability of polycarbonate by several means including foam moulding, injection moulding, vacuum forming and extrusion has enabled new opportunities for the industry players. High mechanical stability, optical purity, better reflective vision, along with resistance against impact, chemical & heat are the key properties enhancing the trivex market. Glass has witnessed reduced consumption in the recent years due to its limited safety during injuries along with evolution of superior materials. Safety spectacles market was valued over USD 770 million in 2016. Shifting employer preference for safety spectacles due to its easy handling and competitive price will drive the industry demand. Several safety product manufacturers provide prescribed spectacles and goggles for workers to correct the refractive errors. Correction of near-sightedness, far-sightedness and astigmatism are the key benefits driving the prescribed safety spectacles market growth. 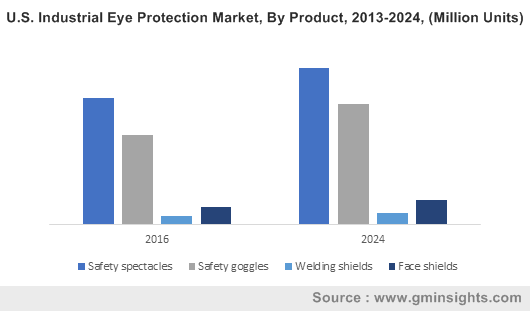 Safety goggles market is estimated to register over 100 million units in volume by 2024. Emergence of laser prevention and anti-fog functionality are the key factors fuelling the industry growth. Increasing demand from pharmaceuticals for several treatment procedures will drive the product development. Welding shields offer combination of comfort and safety during several welding activities including gas tungsten, shielded metal arc and gas metal welding. Excellent features with 180° viewing area coupled with low moisture trapping conditions will drive industrial eye protection market growth. Oil & gas lead the global industry share accounting for more than 25% in 2016. Rise in offshore and onshore activities including exploration, transportation, and refining projects will trigger the demand. Safety regarding chemical spills at operational locations requires advanced safety gears for workers. Construction industry generated over USD 300 million in 2016. Rapid urbanization, increasing investment on construction projects accompanied by worker safety concerns on site will positively impact product penetration. APAC is projected to dominate construction industry over the forecasted period. China, India and U.S. together account for 57% of the global construction industry in 2016. North America industrial eye protection market registered over 35 million units volume in 2016. Necessity for safety measures due to presence of large scale industries accompanied by prevalence for employee health & safety will drive the demand. Increasing R&D spending and product innovations by several companies will support the product scope. Stringent regulations about vision safety during work impacted the requirement for safety gears for employees in Europe. Government promotions coupled with educational initiatives for workers will significantly support in reduction of vision injuries. The region accounted for more than 33% of the overall industry share in 2016. Asia Pacific is the fastest growing region in the industrial eye protection market due to enhancing socio economic conditions particularly in China, India, South Korea and Japan. Rising consumer awareness regarding importance of safety solutions at work along with product convenience in several applications will enhance the product development. 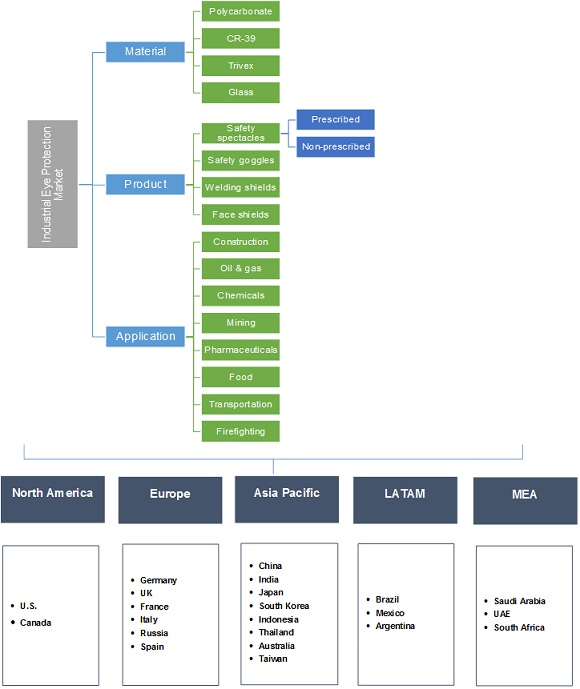 Global industrial eye protection market is moderately consolidated by the few multinational players. 3M, Avon-ISI, Honeywell International, Bolle Safety, MSA Safety, Ansell Healthcare Products, Teijin Fibers and Kimberly Clark are the key industry players. Other notable manufacturers include Wells Lamont Industry Group, Jallatte Group, Bekina NV, Alpha Pro Tech, Z &V Group, Sioen Industries, Eurodress, Lakeland Industries and Gateway Safety. Mergers & acquisitions, joint ventures, production capacity expansion and product portfolio expansion are the key strategies adopted. Industrial eye protection is provided to employees to protect against environmental, chemical or mechanical hazards at workplace. Emergence of total quality management (TQM) will propel industry growth making it mandatory for organisations to comply with appropriate standards for employee safety at work. U.S., Germany, France, UK, and Japan have widely adopted stringent frameworks for worker’s health & safety in several hazardous work situations. Expansion in supply chain dynamics along with advancing technologies for products will positively impact the industry demand.